Oh, THAT’s what it’s got to do with me! After a little back and forth question and answer session, we agreed that when she got home, she’d bring this little chick over and I’d take care of it. 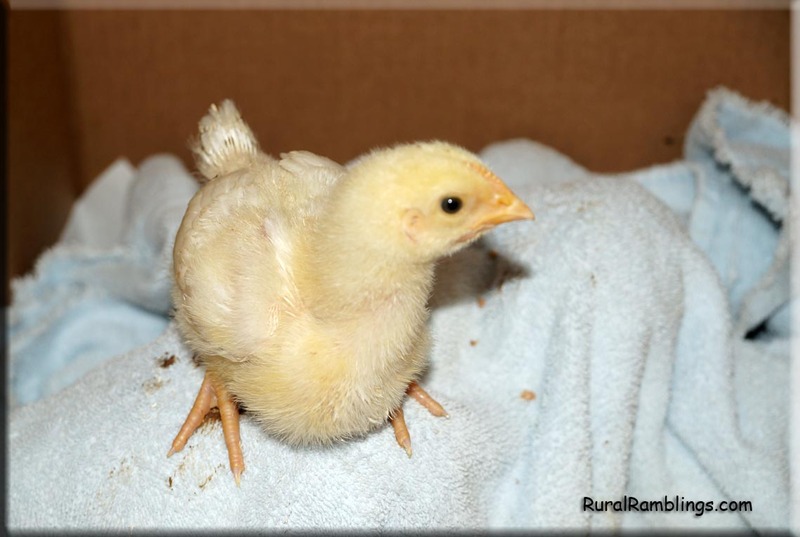 Raising Baby Chickens – I Wasn’t Ready! Not expecting to have any chicks this time of year, I was in no way prepared for one! 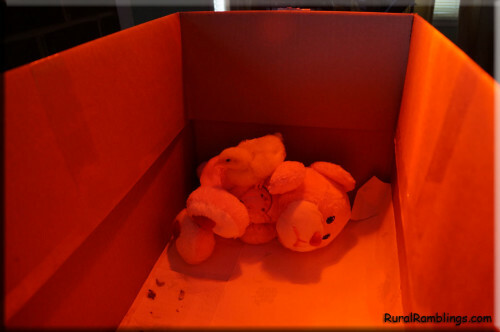 I figured she bought it at Tractor Supply, since they have a bunch of chicks on hand right now, and knew that those are still under an infrared heat lamp. That meant I needed to dig out my lamp and set up a brooder for this little chick to have a chicken home. Now people who raise a lot of chickens often have wooden brooders, but I like to use cardboard boxes because when the chick outgrows the brooder, I can just throw it away. To me, that sure beats having to clean it up for the next go round of raising baby chickens! Fortunately, I had a good sized box The Farmer hadn’t burnt up yet, so got some newspaper on the bottom, then added a layer of paper towels so the chick has better traction walking. Those newspapers can be kind of slick! I cleaned up the water dispenser I have for chicks, and got a little feed bowl, and hit the first real snag… no chick starter feed. Fortunately, I had some scratch grain with some little seeds in it that would make do until I could get to the store the next day and buy the right feed. 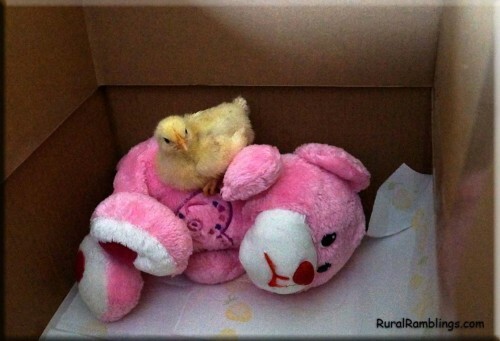 When I have a lone baby chicken, or even just 2 or 3, I add one more unconventional thing to my brooder box…. an old teddy bear. Needless to say, I made sure it’s a washable teddy bear! Although you can wash most teddy bears by putting them in a pillow case and tying it shut, then throwing the entire thing in the washing machine. So finding a washable bear isn’t difficult. The first day I wasn’t sure the chick was going to survive. It laid flat out on the bottom of the brooder and didn’t move. The only way I could tell it wasn’t dead was to watch it for a while to make sure it was still breathing. I don’t know what happened during the photography session, but it seems it plum wore out the model chick! But then the next day, oh Boy! That little chick like to drove me nuts with it’s constant peeping!! Fortunately, it settled in pretty quickly, and is doing well now. Just an occasional peep session, and is active and growing fast! It’s little feathers are growing in, it eats a lot and poops a lot. Pretty much standard chick behavior! Looks like we’ve got another pet chicken! Chicken Hutch – A look at different chicken coops and tractors.